How often do you remind your customers of all the little extras you provide that they most likely take for granted as just a routine part of doing business with you? If you’re like most of us, probably not often enough. Marketing is as much about reminding our existing customers of our value as it is attracting new customers. So how do you gently remind your customers of all the value you bring to them every day? This is brilliant on so many levels – Why is this so brilliant? What marketing purpose does this simple notice serve? For one, it tells their customers they care and they are looking out for our needs and interests – every customer wants to know a business cares, right? Secondly, this simple little sign actually sets the stage for their next rate hike. Yup – this notice is preparing their customers to justify a rate hike for them!!! Think about it, businesses usually wait until we’re increasing our prices to remind customers that we haven’t done so in a while – and that always seems self serving. But reminding customers consistently without asking for anything now, allows us to send a message of care, concern, and understanding. So when it’s time for a rate hike customers will justify it for us! They’ll remember the notice and come to the conclusion themselves, “Well they haven’t raised them in 3 years, it’s only fair…” Absolutely Brilliant! WOW… again, brilliant! Really? Your job, not mine? These days we all feel guilty just standing at the cash register staring at the cashier if there’s no bagger and these guys are telling me we don’t even have to unload my groceries , much less feel guilty about bagging my own? Ok, that’s worth the extra 5 cents for a box of cheerios! So, what sets you apart and what are you doing to remind your customers? Do you offer free testing? Do you perform complementary services? Do you offer longer payment terms than your competition? Have you not raised rates? What are the little – or not so little – things that you – and your customers take for granted? Or did you win an award, donate, volunteer, fund-raise, or get mentioned in the news? Did a customer rant and rave about you? All of these things are toot-worthy! Put a notice on your invoices, website, or your next ad Or include it in a Thank You, Birthday, or Holiday cards. Don’t be afraid to announce these things on Facebook, LinkedIn, Twitter, your newsletter, – or even a special email to clients! 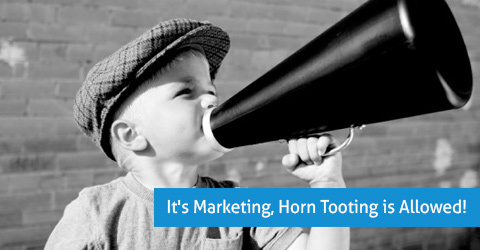 It’s Marketing, horn-tooting is allowed! And, we’re here to help you too. It won’t take long to learn more about growing your business using Oases. Register for a quick, easy and free demonstration to get started.